The Silver Stars are concluding their 3 game road trip tonight in Los Angeles. The Silver Stars are win less on the road this season, and also on the road trip. The Los Angeles Sparks are coming off from a tough loss yesterday in Phoenix and the Silver Stars will need to play they way they have been playing ALL season to get their first road win of the year. This is also the second game of a 4 game series between the Silver Stars and the Sparks. The Silver Stars won the first game behind Danielle Robinson’s great performance and by making LA’s players other than Candace Parker non factors. The AP has the official preview of tonight’s game. The game will tip off at 10.30 pm ET / 7 pm PT / 9:30 pm CT and will be on LiveAccess and or Time Warner Cable Sportsnet if you live in LA. The Los Angeles Sparks. I don’t see the Sparks losing back to back games and usually the second night of a back to back in which a team has lost the night before, doesn’t bode well for the visitors. It will be a close affair and the Silver Stars will make it competitive. Sparks by 5. The San Antonio Silver Stars lost their second consecutive road game of the season to the Minnesota Lynx by a final score of 72 – 87. The San Antonio Silver Stars managed to keep it close through out the first half and led at half time. Midway through the third quarter, the Lynx put the pressure on the San Antonio Silver Stars and were able to gain a lead several times before eventually pulling away from the Silver Stars to win the game. The Silver Stars were very aggressive in the first half and gave the Minnesota Lynx problems which resulted in some physical play and holding Seimone Augustus to just two points on only two shot attempts. The second half featured some of the same from the first half before the Lynx took the lead and held on to it for the rest of the game. Lindsay Whalen was the MVP for the Lynx as she was able to drive by any Silver Star defenders and get to the free throw line. She was also able to facilitate the offense and in the process and got Lindsay Wright and Seimone Augustus to have a big second half. For the Silver Stars, they had a balanced scoring attack with MIP candidate Shenise Johnson leading the way with 16 points. The Silver Stars just couldn’t score in the third and fourth quarter. They got stops, they got to within 7, but just couldn’t get the stops and score when needed to be. They also got out rebounded by the Lynx, just like in their previous game against Chicago. This was one of the problems from last season and its continuing to rear its ugly head again. The Silver Stars bench scored 32 points and are tops in the WNBA in doing that. I really wish Jayne Appel would try to score more. I know she can rebound, defend and pass, but I would like to see her be more aggressive on the offensive end so that the Silver Stars can be more potent offensively. Shameka Christon is struggling big time. She’s shooting 27% from the floor. If she doesn’t find her offense soon, it will be difficult for the Silver Stars to win, especially when they need scoring. The Silver Stars drop to 2-3 on the season and have another tough game against Los Angeles on June 15. The bonus is that LA will be on the second night of a back to back as they play Phoenix on Friday. The Silver Stars are back in action tonight as they face the Minnesota Lynx in their first of 4 matchups. Both teams are coming off loses on the road where they lost by only a handful of points. The Silver Stars have struggled in the Target Center recently, where they have lost their last seven games. The Minnesota Lynx are undefeated at home this season and the Silver Stars will need everything they have and more to pull out a win against the Lynx. The Minnesota Lynx’s five starters are quite the formidable unit and it will be difficult to ask the Silver Stars to guard each position. However, as it is noted, the Silver Stars have played tough, gritty and grind it out basketball in each of their last three games, 2 of which were wins. At this point, the Silver Stars should not be underestimated. The Minnesota Lynx have one of the best social media & web presence in the WNBA and have a scouting report for today’s game. 1. Rebound. Rebekkah Brunson is one of the top rebounders in this league, and if the Silver Stars don’t block out and rebound then Brunson will have plenty of put backs in this game. 2. Defend. That is right. Defend the three point line. Defend the duo of Seimone Augustus & Maya Moore. Defend the paint. This game will rely sorely on the Silver Stars defense and how they make life difficult for the Lynx players. 3. Jayne Appel = X Factor. How well Jayne Appel plays will determine if the Silver Stars can get a road win or go home win less. This game can go either way. Either the Lynx come out hot and take a big lead, or the Silver Stars will be able to to match the Lynx and make it a tight game. The Minnesota Lynx by 10. Their starting 5 is too much to handle, but the Silver Stars will be able to stay close and make it a lot closer. The Silver Stars are in action tonight as they host the new and improved Chicago Sky. The Silver Stars had 5 days rest, after having a week long rest prior to their last game. The Silver Stars played well in their last game and will need to continue play well against a playoff contender in the Chicago Sky. The Chicago Sky have been very impressive as they are 3 – 0 early in the season and have been nearly dominant in their three wins. This is also the first of two match ups between the two teams in three days. This game will feature one of the “three to see” rookies in Elena Delle Donne. She is quite the versatile player and will be difficult to match up for the Silver Stars. I suspect Delisha or Shameka to defend her as none of the other Star players can match her in either quickness or size. Chicago will also have to do without Epiphanny Prince as she was competing in Eurobasket for Russia and now is dealing with an ankle sprain. If Epiphanny Prince played in this game, I would have said that the Sky would have won their fourth consecutive game. However, the Sky will struggle offensively and if the Silver Stars make them work defensively, then this could be quite the battle. San Antonio Silver Stars by 2. It will be close yet I see the Stars being able to come away with win #2 of the season. The San Antonio Silver Stars got off to a quick start and never looked back as they were able to withstand key LA runs that would’ve given LA the lead. The Silver Stars were led by the second year player Shenise Johnson who scored a team high 19 points. It was also her career high. The Silver Stars were able to withstand LA because LA’s two potent offensive players in Nneka Oguwmike and Kristi Toliver struggled in the game. The game would’ve ended with San Antonio winning by a larger margin had they not had their free throw troubles. San Antonio also shot the ball remarkably well and played a much more smoother and crisp offense than their home opener. The Sparks outside of Candace Parker, who is one of the early MVP candidates and Lindsey Harding, couldn’t find anyone else willing to share the load. The Silver Stars also shot more free throws in the game than LA. The San Antonio Silver Stars who already had a week’s rest, now get 5 more days to rest before they face the Chicago Sky at home on June 6th. – With that first observation, the Sparks could have easily overcame their struggles and STILL would’ve won or come close to winning had that 3 by Lindsey Harding with less than a minute remaining had gone in. Which is saying something. – Shenise Johnson continues to impress me. She shot the ball well, she attacked the floor, she made a 3, and she was rewarded for leading the team with 19 points. She looks every bit as the player that came advertised out of the draft for possibly competing to be the ROY last year alongside Glory Johnson, Nneka Ogwumike and Shekinna Stricklen. – Danielle Robinson made good plays and was more assertive in terms of what Dan Hughes asked from her. She needs to keep this up in order to help the Silver Stars fight in the tough Western Conference. – Marissa Coleman looked like a different player than she did against the Seattle Storm. And that’s not a good thing. -Ebony Hoffman once in a while will come off the bench and play well. She certainly did that against the Stars. – One last note – Delisha Milton Jones came to PLAY today. No doubt about that. The LA Sparks have now lost TWELVE of their last FOURTEEN games at the AT&T Center. I have no idea about why they play poorly in that arena. The Sparks and Stars now have identical records tied at 1-1 a piece in the early 2013 WNBA season. The Silver Stars are FINALLY back in action tonight as they host the visiting LA Sparks at the AT&T Center. It’s been one week since they last played and after tonight, they will get another 5 days of rest before their next game. This is the first of 4 meetings between the teams. They will play again in LA on June 15th. The game will be at 8 pm local time and be televised on TWC Sportsnet and on WNBA LiveAccess. The Silver Stars are coming off a bad loss against the defending WNBA champs in the Indiana Fever. They started off the game on the right foot, but eventually let Indiana back into the game and could not sustain the energy and effort in the first half. Indiana went on to win and did so in a convincing matter. 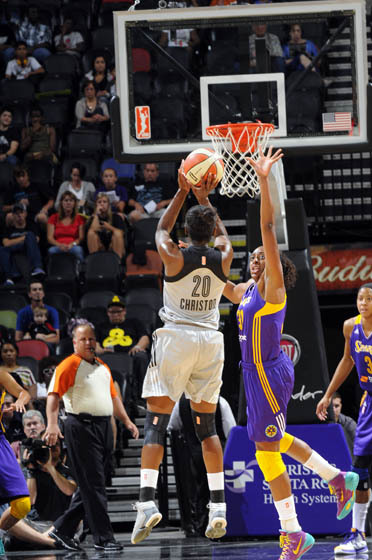 The Los Angeles Sparks are coming off a blowout win against the Seattle Storm. The game was close throughout until the third quarter started, with LA outscoring Seattle 31 to 12. The Sparks were led by Kristi Toliver who scored a game high 17 points. 1. Defend the interior or paint – Last time, the Fever had a field day with the paint, and were able to score easily inside against the players. If the Stars don’t defend well inside, both Candace and Nneka will be able to score easily and effectively. 2. Make the “others” beat you – Candace Parker, Nneka Ogwumike and Kristi Toliver all will play well. But in order for the Sparks to win, they will need contributions from other players such as Jenna O’Hea, Marissa Coleman and the others. If the Silver Stars can make those players a non factor, they have a great shot of winning the game. 3. A potent offense – The Silver Stars struggled with their offense last game and need to run better plays and sets for Jia Perkins and Danielle Adams. Danielle Robinson will need to be better at getting the ball at the right spots to the right people. Notes* – Becky Hammon is still injured and is out for the month. Sophia Young is out indefinitely.